Can Tho (VNA) – Saltwater intrusion in the Mekong Delta at present is comparable to a once-in-a-century disaster, Minister of Agriculture and Rural Development (MARD) Cao Duc Phat said on February 17. 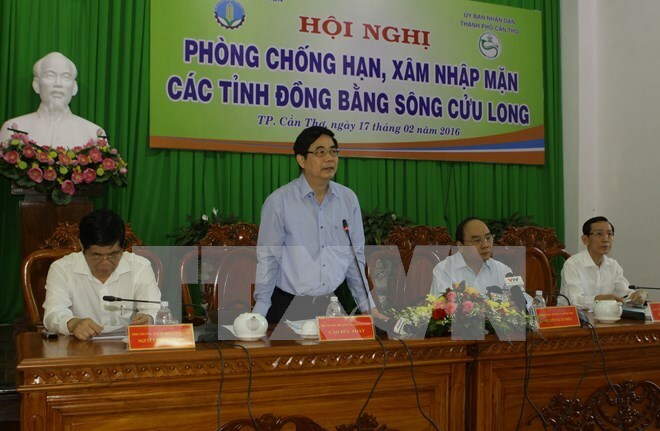 At a meeting in Can Tho city, Phat pointed out that more than 200,000 tonnes of rice have been damaged, resulting in a loss of over 1 trillion VND (44.64 million USD) to the region. The ministry reported that saltwater intrusion appeared two months earlier than previous years due to serious river water shortages. The salinity in the Vam Co, Tien and Hau Rivers and other rivers near the West Sea is now higher than traditional levels. Meanwhile, saltwater has intruded upstream 50 – 60km into the mainland, and even 93km in the Vam Co River’s neighbourhood, about 15 – 20km deeper than previous years. This is the worst saltwater intrusion so far in the Delta – the rice hub of Vietnam, the ministry stressed. In the winter-spring crop 2015-2016, more than 339,200ha of rice in coastal Mekong Delta provinces is prone to saltwater intrusion and drought, accounting for 35.5 percent of those localities’ rice area and 21.9 percent of the region’s total rice area. Of them, 104,000ha have been severely impacted. The National Centre for Hydro-meteorological Forecasting said saltwater intrusion has already reached alarming rates in Ca Mau, Kien Giang, Ben Tre and Tra Vinh provinces. Director of the centre Hoang Van Cuong said the water flow from upper rivers to the Mekong Delta this dry season (from November to April) will be low, leading to very acute drought and saltwater intrusion. Meanwhile, Tang Duc Thang, Deputy Director of the Vietnam Academy for Water Resources, said the intrusion will prolong until May or even July if the region lacks rain. Other participants at the meeting also warned of the recurrence of severe intrusion for many years ahead, adding that the impact will linger for decades. The MARD said it urged ministries, sectors and localities to consider saltwater intrusion prevention as an extremely serious mission, and to drastically devise both short and long-term solutions. The ministry also suggested relevant ministries and localities support residents in areas where agricultural cultivation was suspended; and build temporary dams and culverts, dig ponds and wells while dredging canals to store water and prevent saltwater incursion. Minister Phat said the earlier anti-intrusion actions are taken, the less losses there will be. At the meeting, Deputy Prime Minister Nguyen Xuan Phuc asked relevant sides to firstly ensure drinking water for local residents. Vietnam, which lies at the end of the Mekong River, should also keep negotiating with other countries in the upper part, on water related issues, he said.